You will earn 1,656 Reward Points. Earn 1 reward point for every 1 dollar spent. An automatic safety pilot for each burner for safe and easy operation. Heavy-duty 4” adjustable legs to fit your countertop line-up requirements. Spatula wide 3-1/4” front grease trough and grease chute for easy cleaning. Available in 24", 36" and 48" widths to meet your space and volume requirements. Heavy-duty body construction with stainless steel front, side panels, bull nose and 4-1/2" high tapered splash guard. NEW highly polished 1” thick polished steel plate for superior heat distribution, fast recovery and energy efficient operation. “U”-shaped 28,300 BTU aluminized steel burner every 12” of cooking surface provides even heat distribution and maximum performance. NEW throttling thermostat inserted into the griddle plate 5/16” from the cooking surface, adjusts from 150° to 450°F providing quick response to surface temperature change. For breakfast, lunch or dinner, Star-Max throttling thermostatic griddles provide flexibility for a variety of menu items. Griddles operate on Natural or Propane gas. These units are approved for installation within 6" of non-combustible surfaces. Star-Max® griddles feature 1” thick polished steel griddle plate 4-1/2” high wrap-around stainless steel splash guard and 3-1/4" wide front access grease trough with 4-1/2 quart grease drawer capacity. Includes a 28,300 BTU aluminized burner every 12" of width controlled by a throttling thermostatic with safety pilot, 3/4" N.P.T. male gas connection with convertible pressure regulator, and 4" adjustable legs. Star-Max® gas griddles are covered by Star’s TWO YEAR parts and labor warranty. Gas griddles are constructed with stainless steel panel and double wall aluminized steel side panels. Griddle plate is 1" (2.54 cm) thick, 4-1/2" high tapered wrap-around stainless steel splash guard come standard. 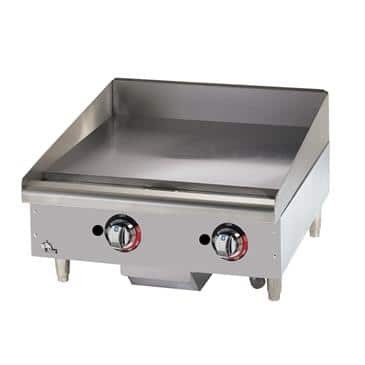 Unit has a 3-1/4" (8.3 cm) wide front grease trough with grease chute and a 4-1/2 quart (4.26 L) stainless steel grease drawer. Unit is heated by 28,300 BTU alu mi - nized steel burner for every 12" (30.5 cm) of griddle width and is controlled by a throttling type thermostat embedded into griddle plate. Thermostat knobs are protected by a stainless steel bull nose front. An au to mat ic safety pilot is provided for each burner. Griddles are supplied with 4" (10.2 cm) high die cast nickel plated steel legs that have a 1-3/8" (3.5 cm) adjustment. Gas connection is 3/4" N.P.T. male and a convertible pressure regulator is provided. Units are approved for installation within 6" (15.2 cm) of combustible and non-combustible surfaces and are UL Gas certified and Ul Sanitation listed. Printed in the U.S.A.